Everything in the TM bowl, the dough was fantastic to work with; the hardest part was ensuring the little head on top was done properly and would sit straight up. 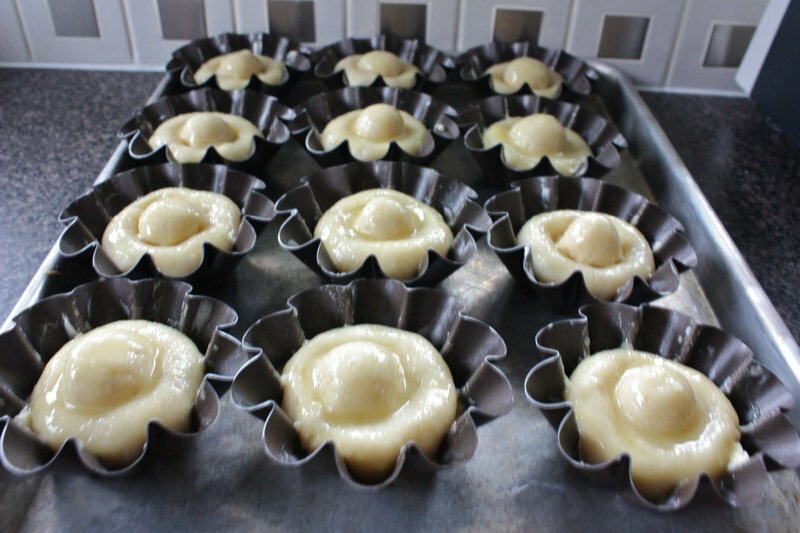 No guarantees… they are all in my little pans purchased from Dehillerin in Paris. Rising, for the second time, in their cute little shapes. and voilÃ ! 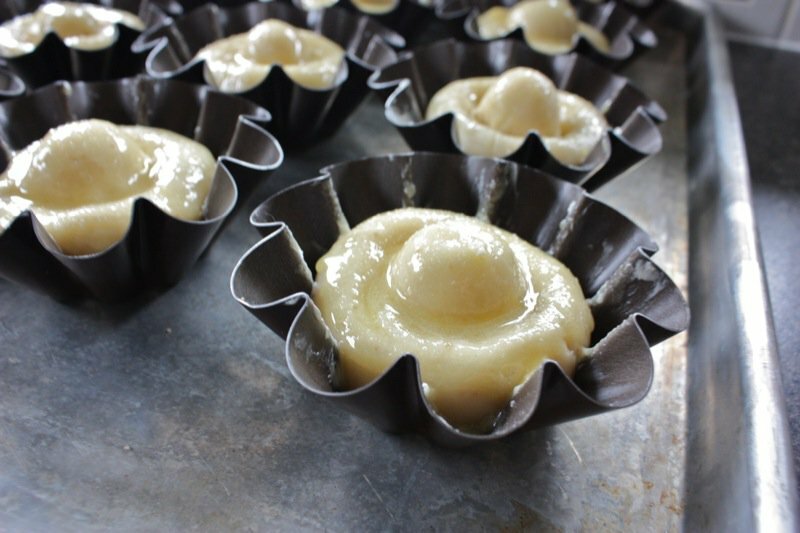 They still look perfect and are ready for the oven! But I know better. 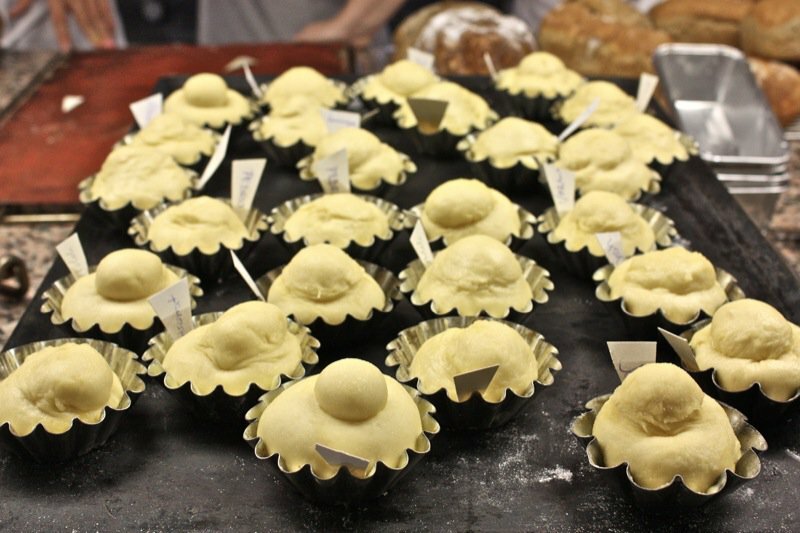 They all looked this perfect in Paris, this past summer, at my bread making Atellier at Le Cordon Bleu. Yet, only the teacher’s came out of the oven “with its head on straight”! I held my breath, and every one of mine was manifique! I was overjoyed. Look at that colour! 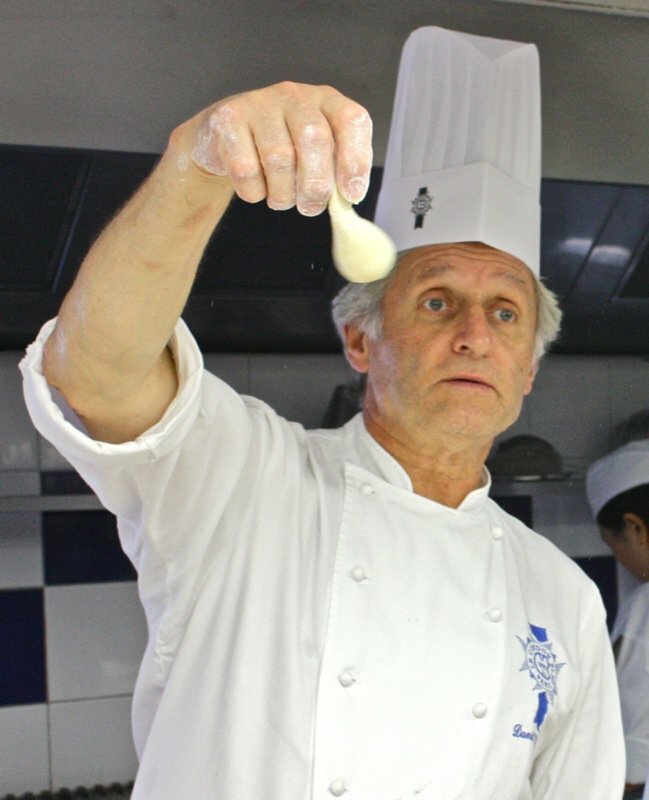 So, let’s revisit my lesson at Le Cordon Bleu in July of 2010. Chef Walters had saved some dough from a previous class and had it brought out of the fridge at the end of the day when we were asking questions. We were small and efficient class, so had some extra time. Lucky us! 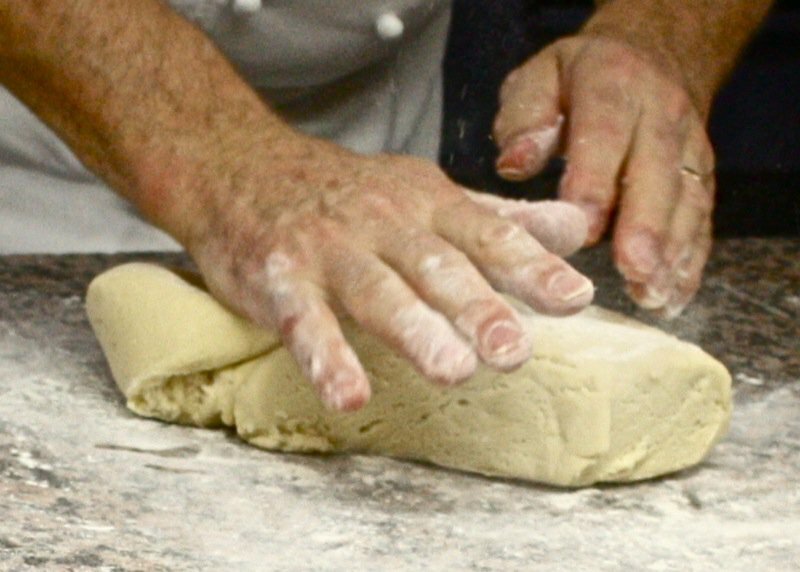 He started to work the dough, but it was too cold, so he just cut it into individual portions. Most only took one. Everyone was offered more. I took three. 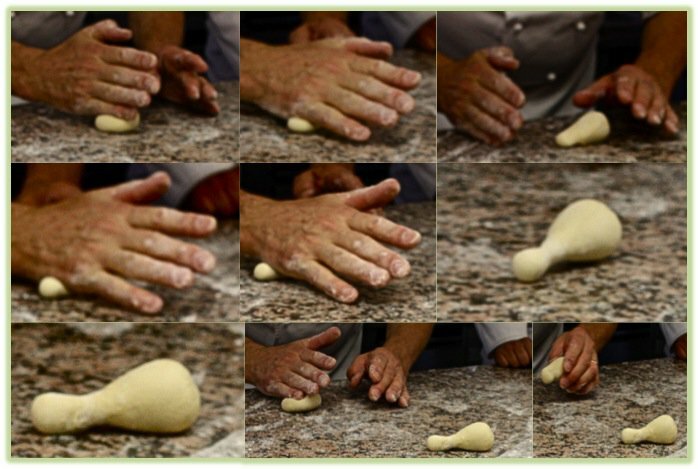 He had us warm the dough in our hand and go through the (by now memorized) way to fold the dough like an envelope after flattening it; then roll it into a ball with your hand cupped. Now, the tricky part: making the adorable little head. 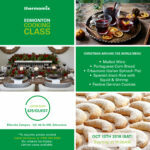 At this class, so few were successful, as you will see. 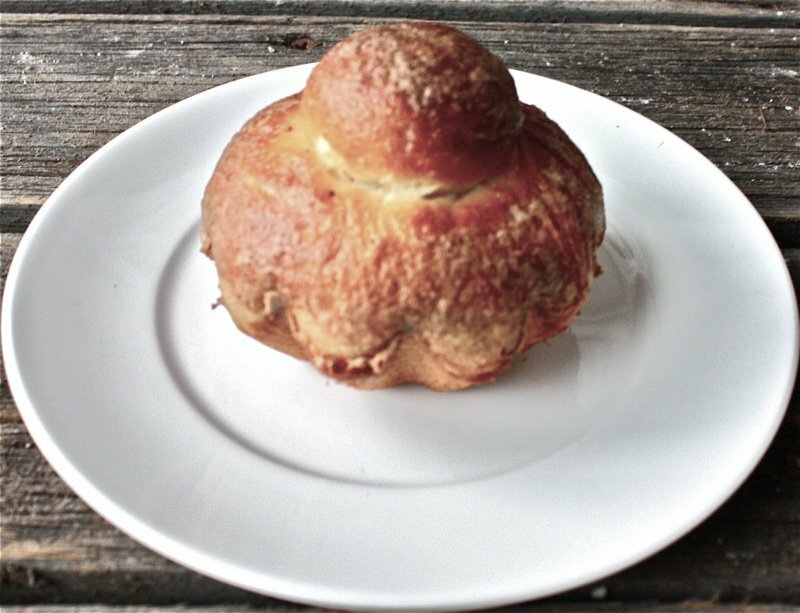 Thus, my proud smile and wagging tail at the beginning of this post when I so proudly presenting my own homemade brioche: head standing tall! 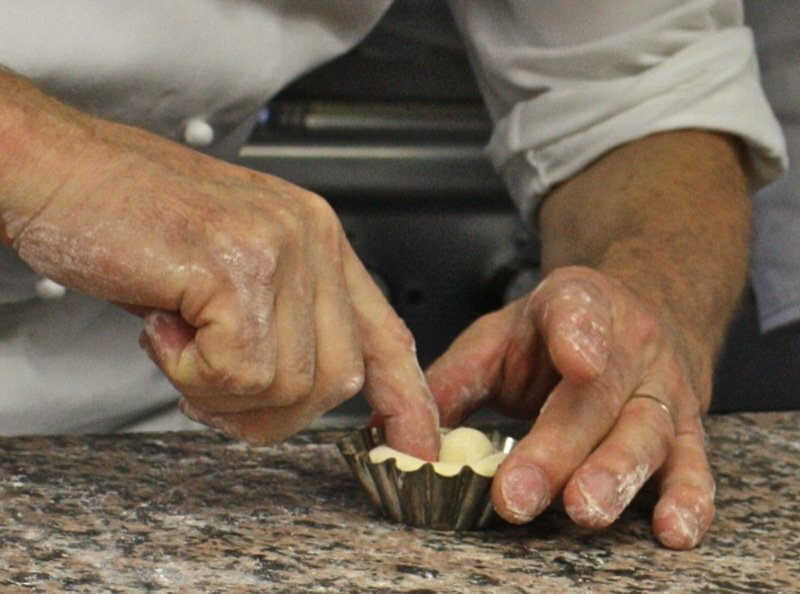 You can see how Chef Walters uses his baby finger to etch out about 1/4 to 1/3 of the dough ball. 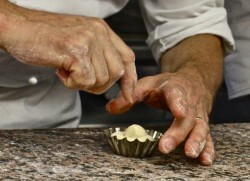 Then, continuing to use the side of his hand with gently and even pressure, he forms what looks like a bowling pin. He did it over and over exactly the same way. But, before we had at it, he showed us how to tuck in the head to get it to stand up straight. 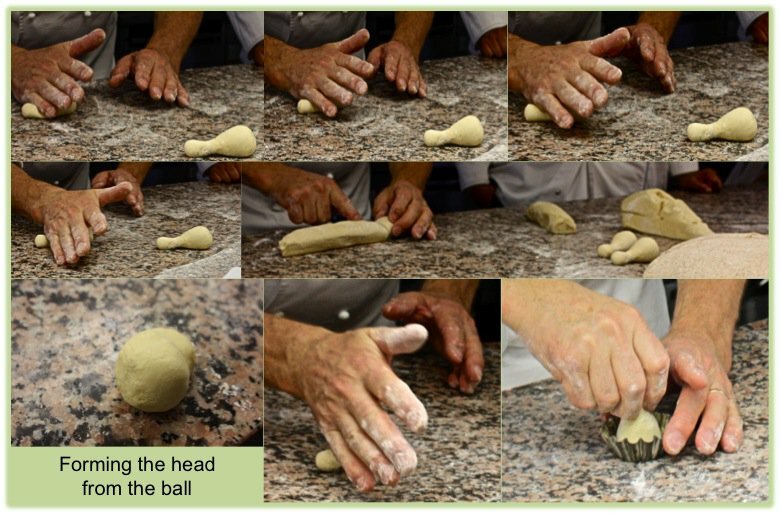 You can see above that he has plopped the dough into the form and then uses his forefinger to nestle the head into the ball, upright. Below, he has completed one side. In slow motion, he will do the other side. Do you see how he aims at a 45 degree angle and pushes the space in under the head. He repeats this all around the head and then it sits on top, happily. You will see it nestled in position, below, right. 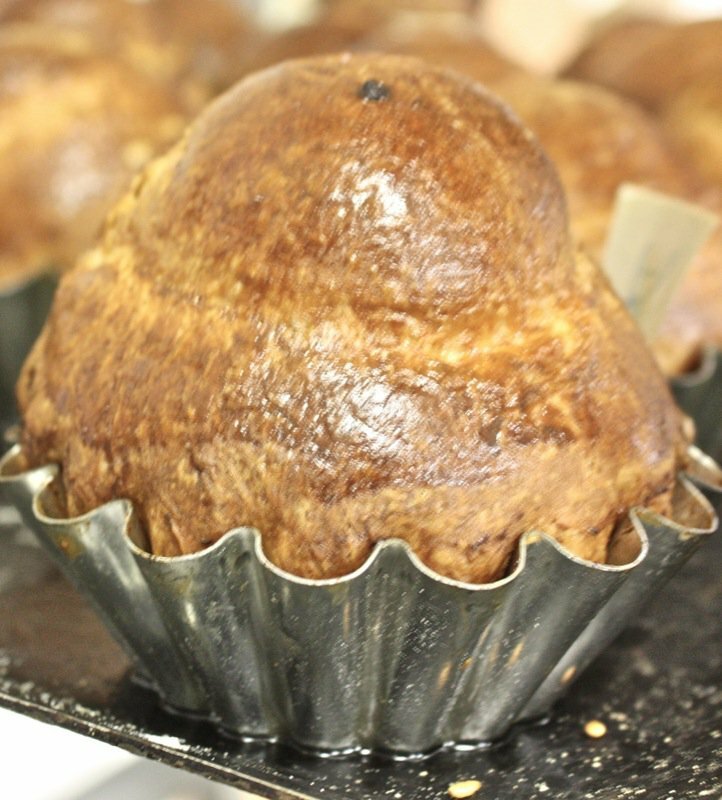 This is Chef Walter’s brioche, above. Mine are below… well, his is, too. 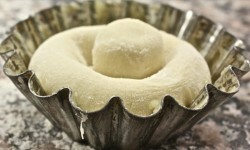 Seeing the student brioche forms, and comparing it to my own pan, had me really astounded at how well he had taught us. I was afraid when I began. Not afraid to fail, just afraid I would not learn how to do it better… and then maybe be too discouraged to want to make them again. This is the Chef’s. He said it was “OK”. He wasn’t happy. I thought it was a masterpiece… but, I do understand. 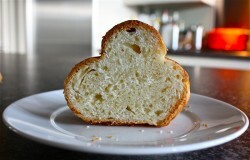 Richard Bertinet’s brioche that he demonstrated for us leaned over when baked. I love the charm in that, too. 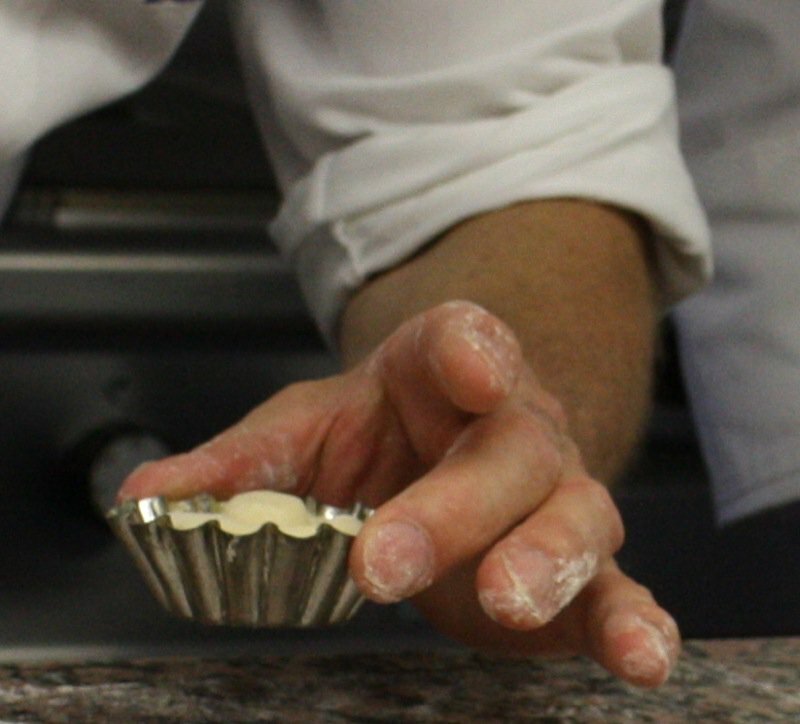 He was very happy with the crumb in these, and that might help you to understand why I was so pleased with the crumb in mine! 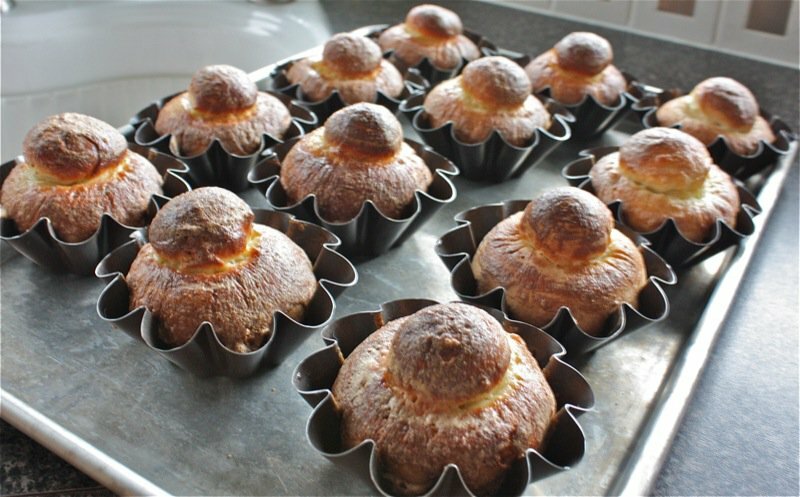 Below are my oven ready brioche… just for a little last minute comparison! 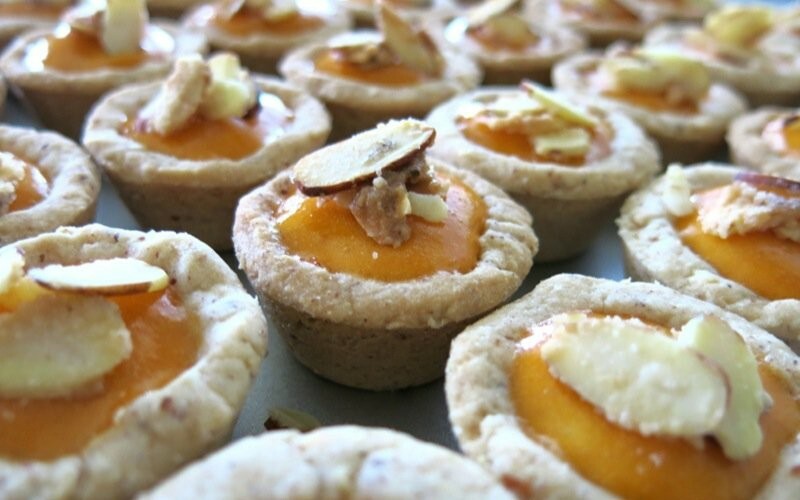 I cannot wait to make them again. 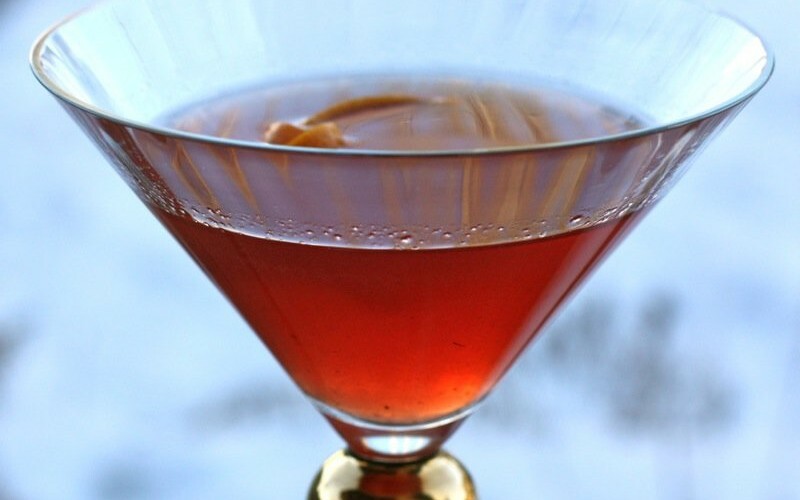 I have, actually, a few times, since this… and I am thrilled at how easy they are to make, now that I know how! 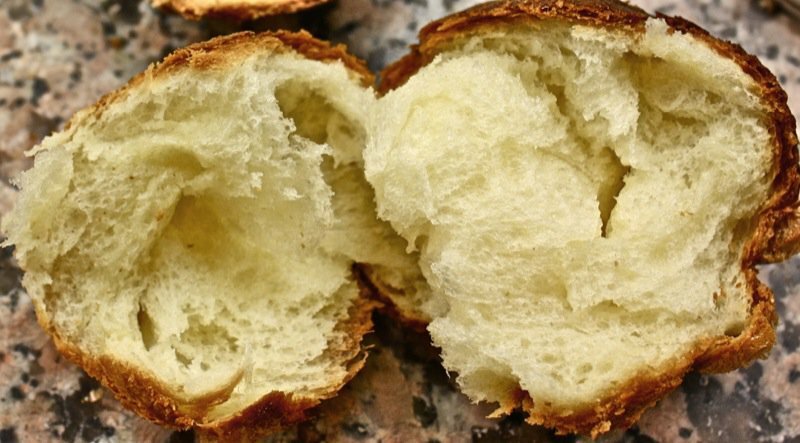 Note: This is a very sticky dough and would be very difficult to form individual brioche with, but it makes an incredibly rich and delicious brioche! And, in case you think I showed you the only one that turned out…. no, no… no. They all did! These are excellent petite little brioches. Your instructions are so very helpful. 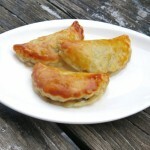 I must try these very soon. 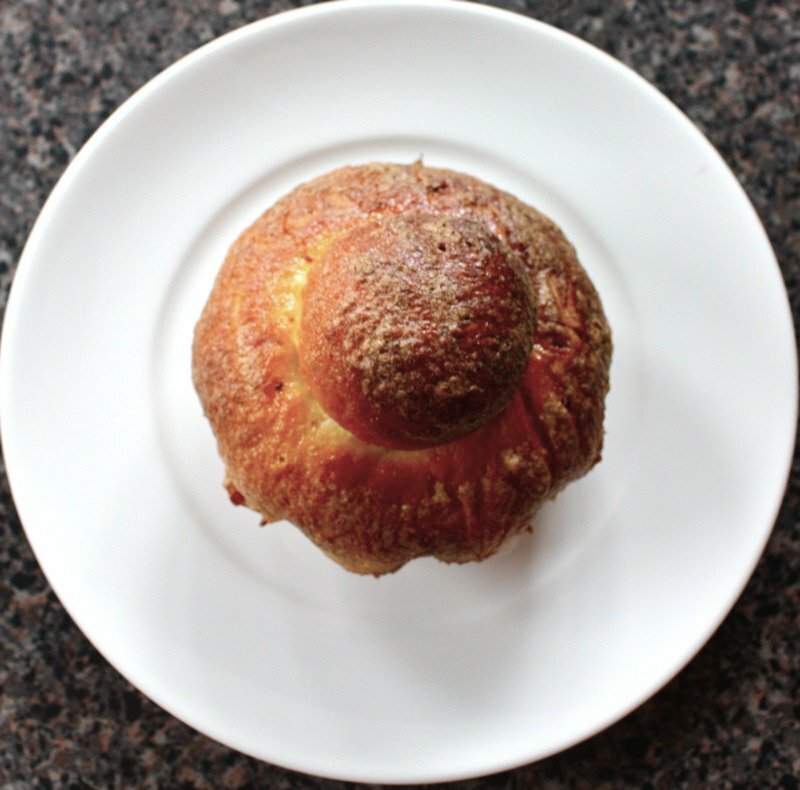 Yes, I have seen your lopsided brioche – and LOVE it. 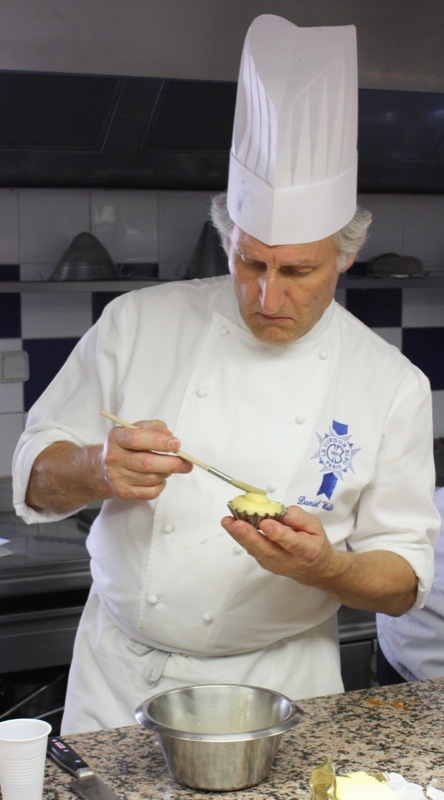 Richard Bertinet’s was lopsided when he demonstrated them to us, and you saw how Chef Walter’s turned out in this post (and he is from Le Cordon Bleu), so… love the lopsided heads! But, that is also why I was tripley thrilled when my little heads were standing at attention! Beautiful! 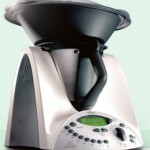 Now I want a thermomix!!! I’m not even sure if they sell them in the States but the dough is amazing. Honestly- yours look better than the ones made in the class. El! I know! Wasn’t I lucky!!! 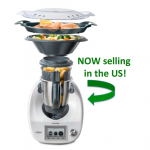 They do NOT sell Thermomix in the US”¦ but, should you ever be serious, I sell them and can ship to you within 7 to 10 business days. Lucky me, eh? I have two, I love using mine so much. Mind you”¦ I sell them. I did make the brioche by hand, first. 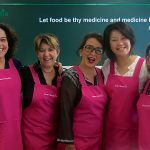 I do believe in doing everything by hand ““ first, so you know what you are looking for and what to do”¦ but after that, hey”¦ I would never be making bread daily and such, with out my Thermomix! It was the highlight of my dinner there, too. 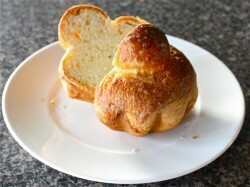 Best brioche ever – and the foie gras is what motivated me to make my own foie gras au torchon! Superb! 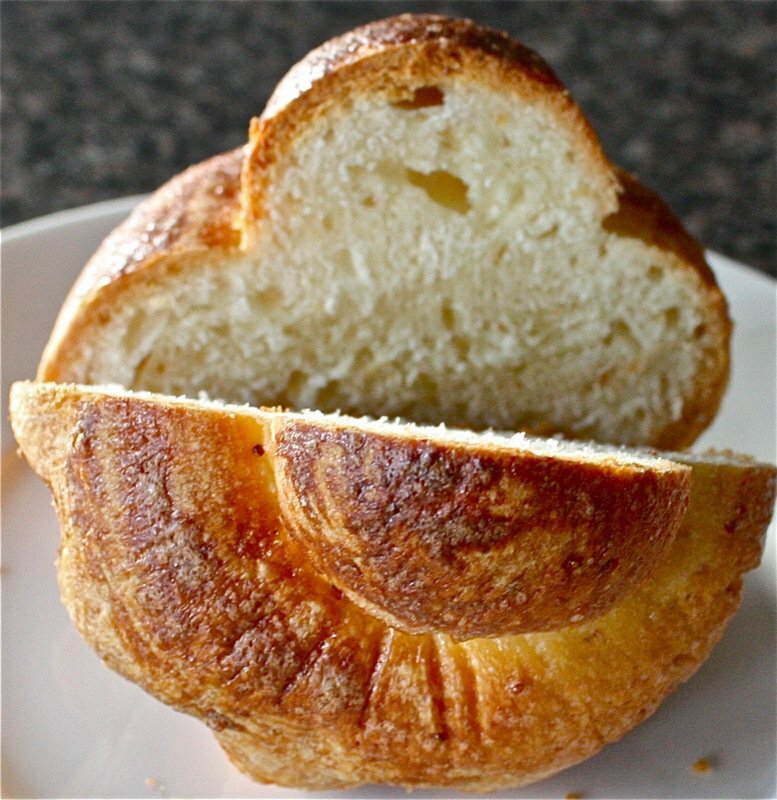 Honestly, I have never heard of a brioche. They remind me of those Yorkshire pudding. This looks much more complicated than a Yorkshire Pudding though. 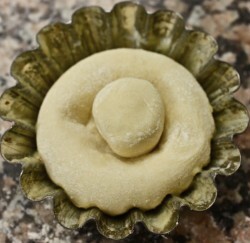 Then again, I know nothing about baking so I really hope I’m not insulting you by saying it looks like a Yorkshire. 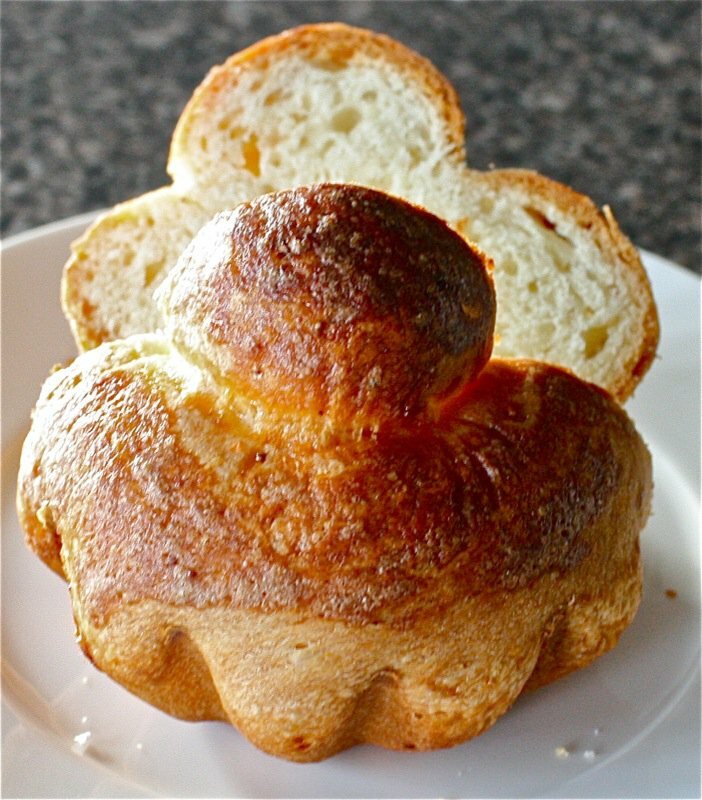 Your brioche look beautiful. 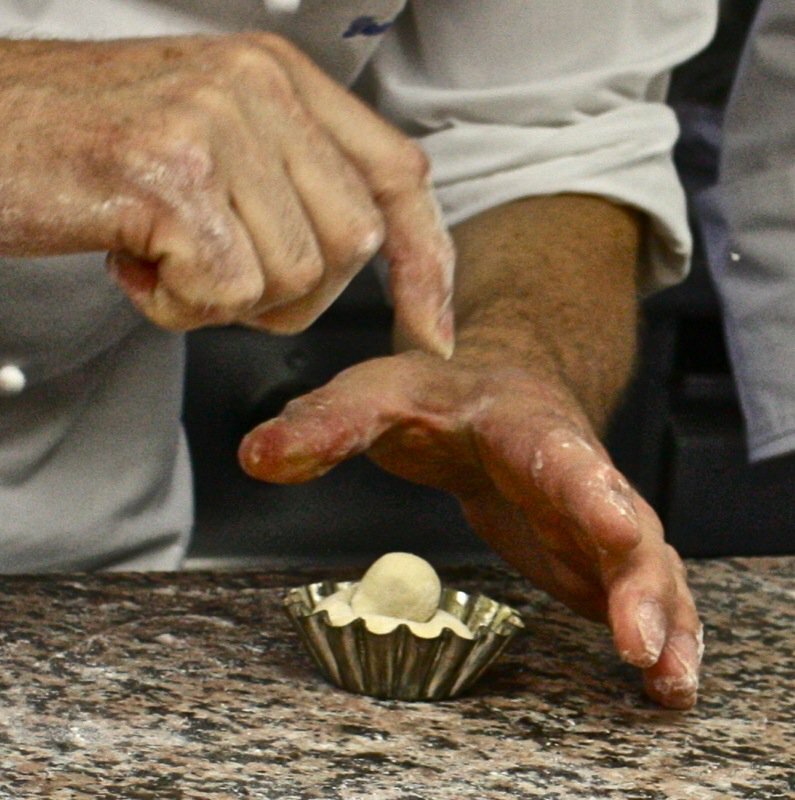 I really cannot tell which is yours and which is Chef Walter’s. I can tell that this is another one of those things that look and sounds so easy, but when you get to doing it, nothing goes right. The pros always make everything look easy 😉 This human cookbook sure is expanding with recipes by the day. I’m also curious, do you use a program to store all your recipes, pen and paper, or just by memory? 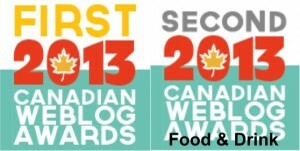 I’ve been bookmarking so many recipes that the OCD in me is starting to itch at organizing them somehow. 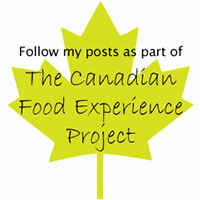 I store my recipes as I do on my site… Mainly, my site is my first line of reference through the recipe index. It is now alphabetized. YAY. 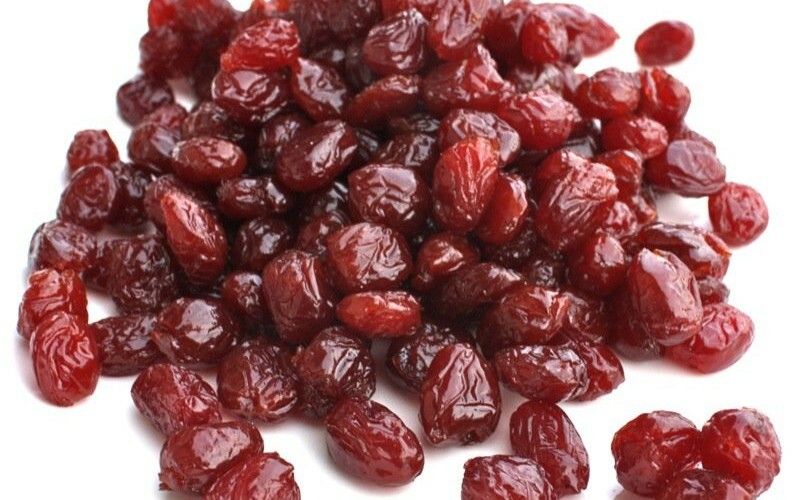 I have all my other recipes on my hard drive in folders. Recipes: then many folders like: Appetizers, Soups, Salads, Mains, Desserts… etc (just like a cookbook) and the recipes are stored in each one. I have two sets like this. 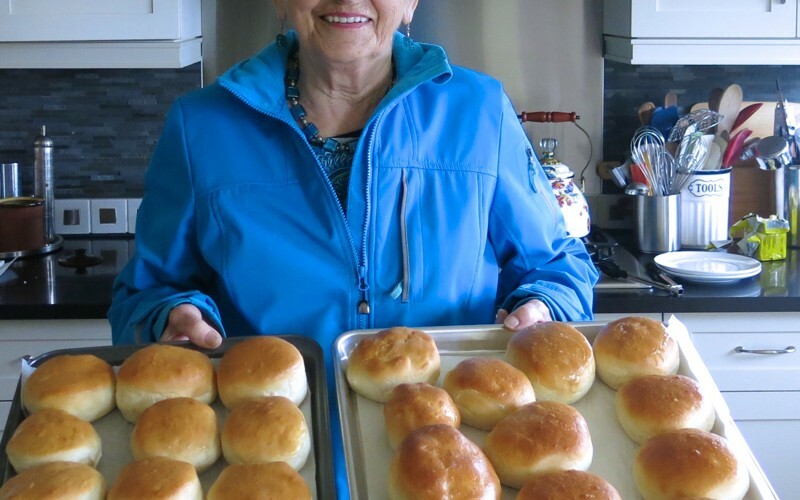 One set of the tried and true family traditional recipes, and another set that I am gleaning from the posts i read that I want to try. It is my new year’s resolution to try many of those! Yes, I really need to organize my blog too. But I wouldn’t have that many to organize, that’s partly why I’ve been putting it off…teehee. Thanks for the tips! 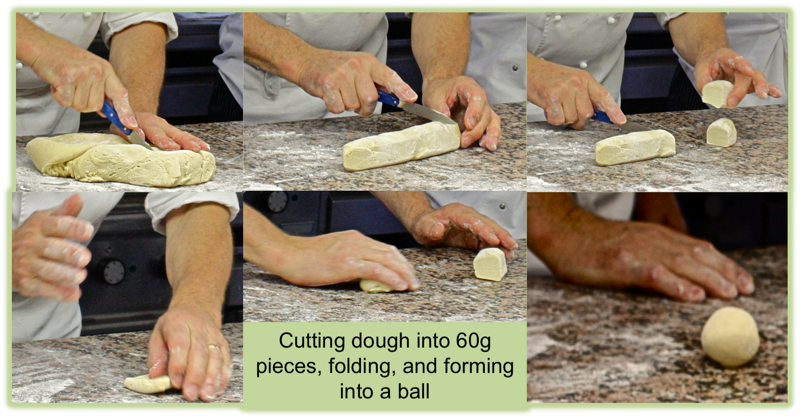 HH – I bought both books: Crust and Dough by Bertinet – before I took the course, and practised the kneading for a year… just by watching his video. He was impressed at the class and I improved immediately with that practice under my belt and his immediate coaching. I was beaming. 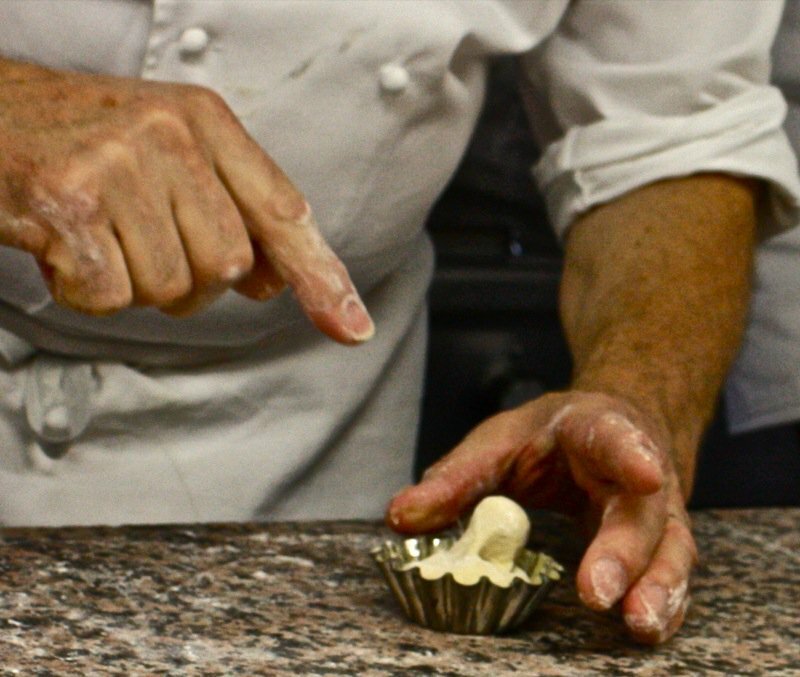 I love his technique, but it does take a whole lotta practice. NICE work! These are beatiful. 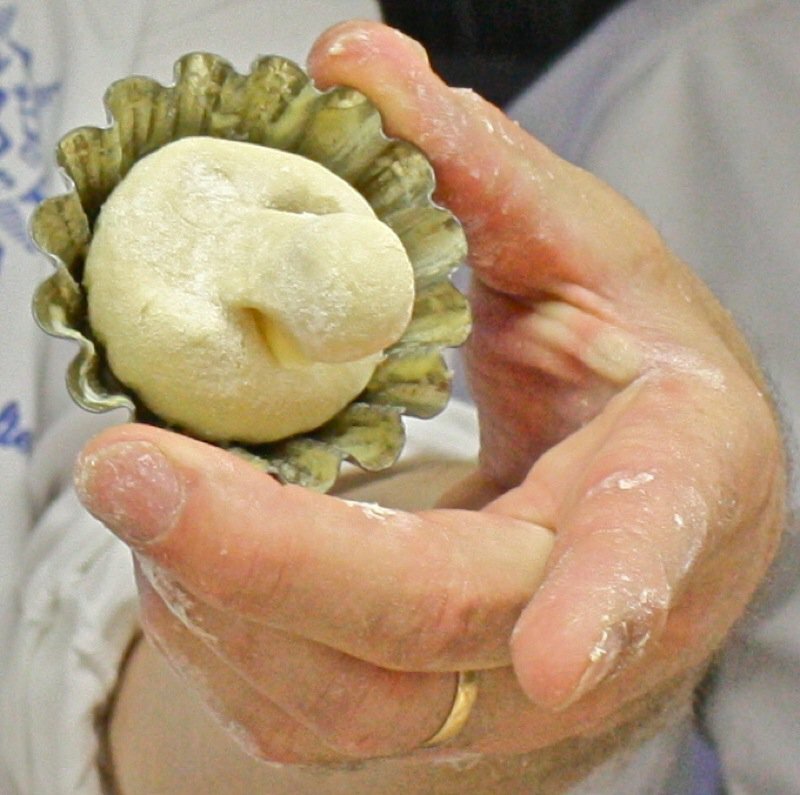 There’s also the “cheating” method for making brioche heads sit up straigt: Divide the dough for each brioche into two pieces, one large and one small. Form the large one into a “donut” shape and the small into a “tadpole.” Slip the tadpole end into the donut hole and voila! This sounds so graphic. Sorry! Hi Valerie, such beautiful masterpiece and Tq for such great sharing. 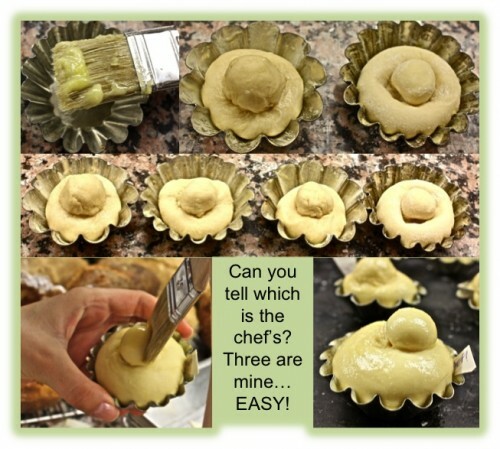 May I clarify on the step 3&4 Richard bertinet’s recipe, the yeast scaled in for twice? Thank you for catching that! Yeast should never touch salt so omit the yeast in step 3 and add it in step 4. I will correct the recipe when I get home! 🙂 let me know how it goes!